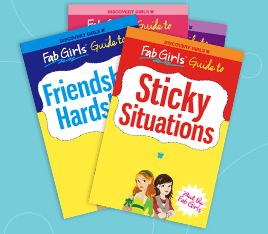 Discovery Girls Books and Magazines are modeled after the women’s magazines that we all love, but they are meant for girls ages 7-12. They include advice columns on topics from bed wetting to boyfriends, quizzes, product reviews for all the trendiest must-haves, articles on both interesting and difficult topics, and highlights on famous young actors and actresses. Best of all, they’re sure to appeal to any tween, since all of the articles are written by girls just like them. Though the problems might be oversimplified, it’s a great way for girls to get solid advice—and maybe it’ll inspire them to take part by contributing themselves or mediating problems with their friends. It might even open up some lines of communication with Mom and Dad. These magazines are something any girl will love, and all parents will appreciate as well. Visit DiscoveryGirls.com for more information.